Six years after the release of Jane Harris’s debut novel The Observations, I still remember the voice of Irish servant girl Bessy with a clarity I wish I could summon for everything that I read. Her second novel, Gillespie and I had attracted plenty of buzz even before being long-listed for the Orange Prize 2012. I enjoyed this one even more than the first, but it’s a challenge to do justice to its literary merits without ruining the story, and I gather some reviewers have done just that. As a reader, spoilers absolutely madden me, and as for how writers must feel about their carefully wrought plots being served up on a plate… hence my obliqueness here. 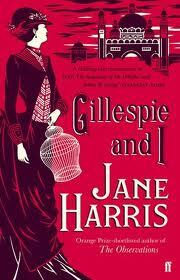 Gillespie and I is presented as a memoir by Miss Harriet Baxter, an elderly lady writing in London in 1933. Her stated wish is to set the record straight on her notorious dealings with the Gillespie family in Glasgow in the late 1880s, the most ‘profoundly affecting events’ of her life. The narrative is mostly set then, but at intervals it cuts briefly to the time of writing and Harriet’s struggles with old age and other preoccupations. When she arrived in Glasgow in 1888 at the start of the International Exhibition, art lover Harriet Baxter was in her mid-30s and newly released from nursing her late aunt in London. Both of the things which made her unusual for her time are central to the story: she is an ‘unmarried lady’ and thus to many an object of pity; she is also ‘of independent means’. After crossing paths with talented but struggling young artist Ned Gillespie, Harriet becomes both trusted family friend and valued patron. A witness to every one of his extended family’s ups and downs (of which there are many), she becomes embroiled in practically every aspect of their lives: promoting and protecting Ned’s artistic reputation, becoming confidante to his beleaguered wife Annie, also an artist, and empathising with the couple’s difficulties with their troubled elder daughter, 7 year old Sibyl. In Harriet Baxter, Jane Harris has again created a unique and compelling narrative voice. She skillfully makes a virtue of the limitations of the first person; the reader is uneasily aware of only having Harriet’s word on what took place. There’s nothing unusual about writers creating tension by the withholding of facts, of course, but here it’s more than that; an encroaching sense of doubt and ambiguity pervades the novel almost from the start. The complex Harriet arouses strong and mixed feelings. Like all the best characters, she is hard to pin down; often self-righteous, voyeuristic and meddlesome and yet at times pitifully isolated and vulnerable. Her reaction to some of the more unsavoury goings-on really gave me the creeps; it’s all captivatingly sinister. Her inability to confront her own motives makes it teasingly difficult for the reader to be certain of them either. Gillespie and I is a long novel at 600 pages –but it’s so insanely and enjoyably gripping that it didn’t take me any longer to read than an average book. When, around the mid-point, a tragedy pulls Ned Gillespie’s family apart, Harriet Baxter falls under suspicion as an outsider and the perspective widens, like a camera panning out. Now we get a much greater impression of how she is seen by others, and the mystery of whether she bears any responsibility for the family’s suffering deepens even as attempts are made to solve it. In addition to the International Exhibition, other notable events such as new works by Van Gogh, Ibsen and Oscar Wilde, and the opening of the Savoy in London and the Scottish National Portrait Gallery evoke a time of significant cultural developments. The whole of society is represented from the judiciary to the most impoverished underclasses. I would have liked more understanding of how Ned Gillespie felt about Harriet Baxter before things went wrong (we’re told in the opening paragraph that she regarded him as her ‘soul mate’). There is a new mystery in the later 1933 timeframe which I felt worked more as a device to illuminate Harriet’s personality than in its own right, and, though it pains me to say it, I didn’t find the ending satisfying and felt slightly toyed with. If that sounds like a major criticism, well, normally it would be, but because the rest of the novel worked so well, it’s no more than a quibble. My book group are going to read Gillespie and I (I told them it’s as good as Sarah Waters, and it is) and I can’t wait to discuss it with them. If you’ve already read it, do tell me what you thought. Just remember: be very cryptic! So difficult to write about this one without ruining the story. I think ‘possibly unreliable narrator’ is the only thing you can say! Go on this journey with no preconceptions; it’s well worth taking and you’ll be in expert hands. You’re right, Suzi, Jane Harris is very talented and what she’s done with this novel is really clever.